Peperomia (P.Obtusifolia) known as the Baby Rubber Plant is one of the most desirable houseplants. The compact, succulent plant has nice rounded glossy, green leaves with a slight yellow margin. It branches nicely, grows to about 12 inches high and easily adapts to the indoor environment. It is native to tropical South America and Africa and is related to the black pepper plant. Most grow upright, but some may trail and may be grown in hanging baskets. When grown in the ideal location, the plant will produce white, spike-like blooms. 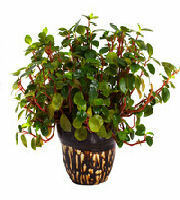 Its appealing beauty makes a wonderful accent plant to add life and cheer to your home, office or any room. The plant's succulent, fleshy leaves and stems require low water. Care must taken to avoid overwatering because the plant is highly susceptible to root rot. When too much water is applied too frequently, roots are deprived of oxygen and diseases such as root and stem rot occur. The best way to water is by watering down or sub-irrigation which means watering from the bottom up. This helps to avoid splashing water on the leaves of P.Obtusifolia and other sensitive plants. Simply place the pot in a shallow pan filled with tepid water and let the plant sit in it until the moisture soaks up to the top of the soil. It usually takes about 15 minutes to allow the root ball to be thoroughly wet. Remove plant and let it drain. You must make sure that the soil is extremely well drained for your Baby Rubber Plant. You can purchase a cactus potting mix, or you can add some sand to your potting mix to improve drainage. A terra-cota clay pot is ideal for this type of plant because they are porous which allows the excess water to evaporate. This way it is easier to control the levels of moisture in the soil. After watering this way for several times, you may notice white salt crystals on the top of the potting mix or on the sides of the pot. These crystals must be removed because they will burn the plant's roots. Leach the soil by periodically running plain water through the pot until it runs freely from the bottom. This will help prevent salts from accumulating that may cause harm to your plants. Light: High light (near bright east or south window). Temperature: 60 to 80 degrees Fahrenheit. Can tolerate 40 degrees Fahrenheit without damage. Water: Water thoroughly, then allow the surface of the potting mixture to dry out between waterings. Humidity: Plant tolerates dry air, prefers average humidity (25% or More) during summer. Fertilizer: Feed every 3 months with a foliage-houseplant fertilizer during the growing season. Do not feed in winter when plant is dormant. Propagation: Propagate in spring from stem cuttings, leaf cuttings, or by root division. If the stems are woody, apply a rooting hormone before putting it in the soil, and be sure to use a well-draining potting mixture. You will discover, indoors or outside on the patio, the peperomia is the ideal choice for a houseplant.